Our labor market area is comprised of nine counties, each represented by a team of professional economic development practitioners. If you’re looking for a workforce that reflects the best and most loyal in America, look no further than Fort Campbell KY, home of the 101st Airborne Screaming Eagles, 5th Special Forces Group and 160th Special Operations Aviation Regiment (SOAR). These 30,000 active duty soldiers as well as the almost 60,000 family members have a huge impact on our economy and are a great source of potential workers. There are 300-400 men and women who join our local labor force EVERY MONTH as they complete their military service. They have learned: loyalty, confidence, motivation, and dependability as well as organization and team skills. These men and women represent the best of our country and we’re proud that the 101st Airborne Division calls this home. 1. ARMY CAREER AND ALUMNI PROGRAM (ACAP). ACAP provides Soldiers, Department of the Army civilians and their family members assistance as they prepare to enter the civilian job market. ACAP also assists employers by providing them access to a pool of highly trained, talented individuals seeking challenging careers in the civilian sector. a. On an average, the Fort Campbell ACAP registers over 350 new clients per month seeking job assistance. As division Soldiers return from deployment, we anticipate approximately 3,400 will separate over the next several months. These Soldiers were held in the military beyond their separation dates because of the deployment. b. There are thousands of active clients registered with ACAP (all ranks/various skills). 2. PROFILE OF SEPARATING SOLDIERS. Soldiers in today’s volunteer Army have a high school diploma or GED. Most have some college. Nearly 25% of Soldiers E-6 through E-9 have at least two years of college. Among senior enlisted women, the figure is 40%. a. Soldiers separating from Fort Campbell are highly trained. Statistics reflect they leave the military with various military occupational skills. Job titles include: Infantryman, Fire Support Specialist, Voice Interceptor, Unit Supply Specialist, Interrogator, Signal Intelligence Analyst, Automated Logistical Specialist, Signals Intelligence, Cannon Crewmember, Medical Specialists, Heavy-Anti-Armor Weapons Infantryman, Motor Transport Operator, Aviation Operations Specialist, Food Service Specialist, Light-Wheel Vehicle Mechanic, Ground Surveillance Systems Operator, Petroleum Supply Specialist, Personnel Administration Specialist, Counterintelligence Agent, and Helicopter Repairer. b. Most separating Soldiers are physically fit, drug-free, flexible, trainable and safety conscious. They are accustomed to working under stress and long hours. Many have hands-on experience as work-group leaders and supervisors. 3. 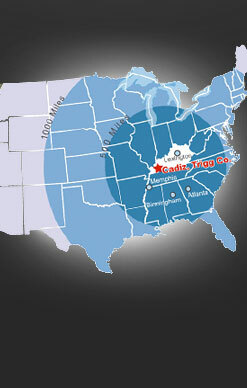 ACAP WEB SITE – www.acap.army.mil. Provides employers access to thousands of transitioning soldiers. By completing a simple on-line registration, employers can post their job leads free of charge for viewing by transitioning soldiers worldwide. Employers have the option of also providing a link to their web page where their job leads are listed. 4. ACAP JOB FAIRS are conducted at Fort Campbell twice a year. ACAP Job Fairs are usually attended by over 100 employers and over 1500 job seekers. The next ACAP Job Fair will be scheduled for Spring 2007. 5. CAREER FORUM EVENTS are held monthly at the ACAP Center. Employers use this forum to provide information about their hiring practices, training programs and job opportunities. A monthly calendar is produced for our clients’ use advertising the events. 6. FAMILY EMPLOYMENT READINESS PROGRAM (FERP). FERP offers employment assistance to non-transitioning military families (adults and teenagers). FERP offers employers the opportunity to connect with their job seekers by posting their job leads with the office at no cost. Job leads are posted until the closing date or the position is filled. 7. PROFILE OF MILITARY SPOUSES. Military spouses are educated, highly-skilled, and trained in a variety of disciplines. Over half of all military spouses have some college training. More than one-fifth have earned a baccalaureate degree. One in twenty holds one or more graduate or professional degrees. Many are licensed or certified in skilled trades or professional fields, with experience in a variety of different types and sizes organizations. a. Military spouses’ resumes demonstrate a variety of skills and experience in a multitude of settings. They have the adaptability to be able to leverage their existing knowledge and experience to learn new skills needed to tackle the demands of a new job. Many have proven their ability to “hit the ground running,” making the best of any new situation. 7. For more information, contact the ACAP Center, at 270-798-5000 or the FERP Office at 270-798-4289.